The first semi final has ended, and ten songs have made it through to the final, some of them more surprising than others. Here is a comment about the show yesterday, the songs that qualified and those who didn’t. I have already been going in depth with all the compositions, so I will not use the space to do that here. Instead I will be commenting on some of the other aspects. First, let’s have a a look at the show. The production yesterday clearly showed that SVT are used to producing shows of that type. Thus there was a very natural flow which was sadly missing last year in Vienna (a somewhat thin and chaotic production according to the writer of this blog). You can forgive that some elements are very reminiscent to the Malmö contest three years ago, especially on the graphic side. The stage is very different though, and unfortunately it can not live up to the one in Malmö: That one was very organic, containing soft lines and “roundness”, and so it appeared very open and inviting. Here there are more sharp edges and more laser light, and the result seems rather cold and impersonal. Some of the songs were also characterized by a very high-tech production with bombastic visual effects. A good example is the spooky shadows on the backdrop which accompanied Greta Salome from Iceland: dark hands about to grab her and birds coming out of her heart. 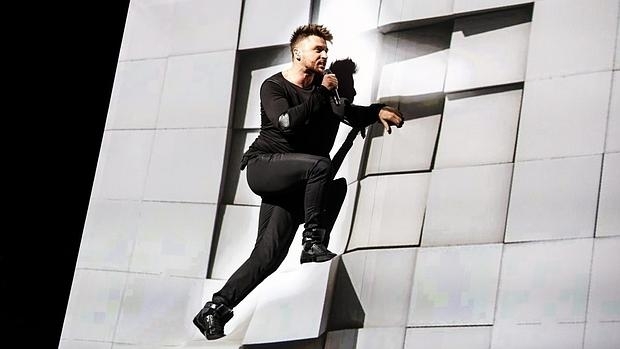 Most striking is perhaps the Russian entry with Sergey Lazarev climbing on some ledges that could not be seen – it looked like he climbed on computer animated elements that disappeared after he had left his feet off them. It almost equals some of the most pompous “circus acts” of the 00’s (e.g. Svetlana Loboda’s grotesque sensory bombardment in 2009). I fail to understand the meaning of making the entry so over-the-top visually. First it quickly becomes tiring; second, and more importantly: it takes the focus from the song, and you almost forget the melody. According to the Danish commentator Ole Tøpholm who read some of the Twitter comments while commenting, many of the Twitter users said just that. Russia is currently favourite to win the contest, but the question is if some viewers will be put off by the over-produced show. Other visual elements were more down to earth though. Among the more striking, if not bizzare, examples were a very big dress worn by the Croatian singer, as well as an astronaut in the Moldovan song (a song which doesn’t bear the slightest musical similarities to Who See’s “Igranka”). The hosts, Petra Mede and Måns Zelmerlöw, are doing a competent job moderating the show in a very natural and warm way. Petra Mede is carrying most of the weight while Måns Zelmerlöw seems a bit more anonymous. However, his presence is giving the presentation some balance, whereas Petra Mede was perhaps a bit too much in the front being on her own in 2013. And I love the joke about Europe and “The Final Countdown”. As usual ten songs have qualified, and the lucky winners this time were: Hungary, Croatia, The Netherlands, Armenia, Russia, Czech Republic, Cyprus, Austria, Azerbaijan and Malta. If you have read my song reviews, you may have noticed that some words were repeated quite often. They included ‘synth pop’, ‘synthetic’, ‘impersonal’ and ‘clinical’. These are words that can be used about quite a lot of songs this year, and especially on those who qualified to the final yesterday. At least seven of them are mostly electronic in their sound. That doesn’t mean that the songs are necessarily bad, but many of them tend to have a similar soundscape and share some of the same harmonic features. The are exceptions: The Cypriot entry is a dansant rock song, and the Dutch country pop song “Slow Down” is another pleasant break from the dominating sounds; there’s a wonderful laid back feeling in it, and it could as well have been released in 1976. Also the Austrian Disney pop in French stands out musically, even if it has never been a favourite of mine. Not less interesting are the songs that didn’t make the cut: Finland, Greece, Moldova, San Marino, Estonia, Montenegro, Iceland and Bosnia and Herzegovina. Out of these only the Moldovan one contains the type of synthetic sound production present in many of the songs. The others are sticking out in different ways: the Finnish and the Sanmarine entries sound like the 70’s disco music, whereas the Bosnian song is a sort of decoction of some of their earlier entries. Unfortunately it can not at all live up to great songs like “Lejla” or “Bistra voda” – the composition was not strong enough to make it. More unfortunate is the lack Greece, Estonia and Montenegro in the final. They are all songs with some quite interesting musical elements, and they could have been a welcome counterweight to all the mainstream synth pop. Also the Icelandic song stood out; I was critical towards it originally, but it has been growing afterwards, and I think Greta Salomé did a very good performance of it yesterday. It will be interesting to see which entries qualify from the second semi final tomorrow, but hopefully we will see a bit more musical variation. 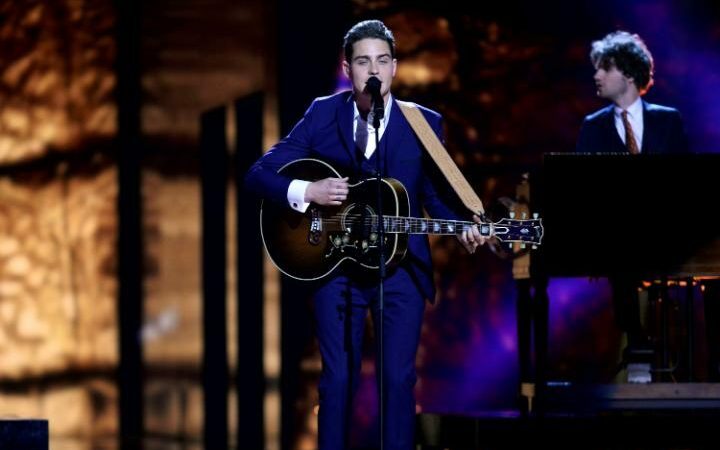 The miss out of musically original songs is not good for the contest. Seriously now, I couldn’t agree more on almost everything you say in this article. Makes perfect sense. Musical Tupperware rules supreme in ESC these days. Is there flag I can wave for Pyrex? Pirex FTW! Yes, pity for Estonia. Greece is different but I don’t like it personally. Iceland was a good package but I am not fun of the song. I will be writing an article about the second semi tomorrow, but so far I think it was a much better result than on Tuesday. Especially I am VERY happy about Georgia qualifying. It is my personal favourite, and I have been very nervous for it. It’s good to see some edge in the final. Latvia, Serbia, Bulgaria, Ukraine and Belgium are also well deserved qualifiers. It was a disaster for the Nordic block. But then, none of the songs were particularly strong, except for Estonia if you count them.